A federal grand jury on Thursday charged former Tesla employee Salil Parulekar with embezzling around $US9.3 million from the automaker, the Department of Justice said in a press release. Parulekar, who worked in Tesla‘s supply management division, allegedly sent money meant for one supplier, Hota Industrial Manufacturing, to another supplier, Schwabische Automotive GmbH (SHW), in 2016 and 2017. Parulekar was charged with nine counts of wire fraud and one count of aggravated identity theft. The indictment does not describe why Parulekar allegedly undertook the embezzlement scheme, and Tesla declined a request for comment. Parulekar, who worked in Tesla’s supply management division, allegedly sent money meant for one supplier, Hota Industrial Manufacturing, to another supplier, Schwabische Automotive GmbH (SHW), in 2016 and 2017. According to the indictment, Parulekar learned in January 2017 that Tesla had ended its relationship with SHW. Parulekar then allegedly created fake documents and stole a Hota employee’s identity, which allegedly allowed him to trick Tesla’s accounting division into switching Hota and SHW’s bank account information. Parulekar was charged with nine counts of wire fraud and one count of aggravated identity theft. He faces a maximum of 182 years in prison and $US2.5 million in fines. The DOJ is reportedly investigating projections Tesla made about the production of its Model 3 sedan in 2017, as well as comments Tesla CEO Elon Musk made in August about potentially taking the automaker private. The Wall Street Journal reported in October that the DOJ is trying to determine whether Tesla made projections in 2017 about Model 3 production that it knew it would not be able to achieve. 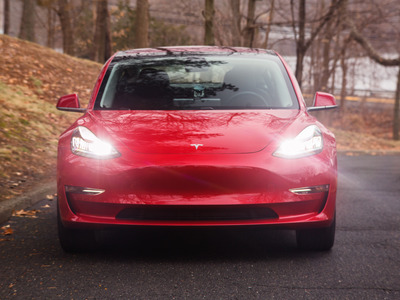 While Musk said in July 2017 that it appeared Tesla could make 20,000 Model 3s per month starting in December 2017, Tesla made just 2,685 Model 3 vehicles in 2017. According to The Journal, the DOJ’s investigation has “intensified” in recent weeks, as FBI agents have reportedly reached out to former Tesla employees who previously received subpoenas and asked them for testimony. The Securities and Exchange Commission has also investigated Tesla’s Model 3 projections and Musk’s statements about a potential go-private deal. The government agency filed a lawsuit against Musk in September, alleging that he made “false and misleading statements” about the possibility of taking Tesla private. The lawsuit led to a settlement that required Musk to step down as the chairman of Tesla’s board of directors for three years and pay a $US20 million fine. Robyn Denholm was named Elon Musk’s replacement as chair of the board this week.